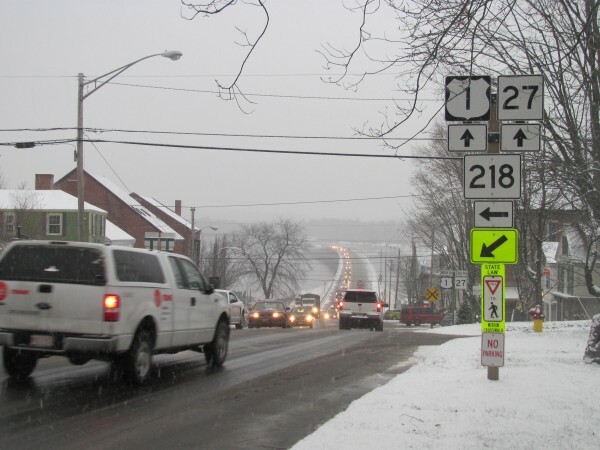 Even on an off-season, snowy day on Friday, Jan. 6, 2012, Route 1 through downtown Wiscasset is busy with traffic and pedestrians. WISCASSET, Maine — Over, under and around all have been scrapped, which leaves through as the only answer for one of Maine’s worst traffic bottlenecks. Anyone who travels Route 1 in the summer knows the situation in Wiscasset: sometimes miles-long lines of traffic inching toward the town that calls itself “Maine’s Prettiest Village” and attracts crowds of tourists. For years, transportation planners and locals have debated what to do about the congestion, with ideas ranging from routing pedestrian traffic crossing Main Street over a bridge or through a tunnel to building a bypass that sends motorists around the town altogether. With the debate as gridlocked as the road and funding for major projects at a premium, the town and Department of Transportation are exploring lesser fixes that Town Manager Laurie Smith said might help, but aren’t an end-all solution. The situation in Wiscasset is just the latest challenge for the Maine Department of Transportation, which has spent tens of millions of dollars over the years on coastal Route 1 between Brunswick and Stockton Springs — an area of Maine not served directly by the interstate system. In addition to continuous paving and rebuilding of the road along the entire stretch, there have been high-profile projects. They include the Coastal Connector, which in 1997 ended what was once known as the “30-minute mile” through downtown Topsham and Brunswick, and the four-lane Sagadahoc Bridge between Bath and Woolwich, which in 2000 eased a ferocious bottleneck on both sides of the Kennebec River — especially during the summer and Bath Iron Works shift changes. All of those investments, according to Martin Rooney, a transportation planner for the DOT, are testament to the fact that smooth traffic flows on Route 1 are critically important for both residents and businesses in the midcoast. “That corridor is as important as any other in the state,” said Rooney. But there are some who believe the state isn’t doing enough, particularly when it comes to looking at improvements on a regional basis and not just town-by-town. In 2000, the 21 Route 1 towns between Brunswick and Stockton Springs began an MDOT-led effort called Gateway 1 with the intention of working together toward large-scale solutions. In exchange for a seat at the table when it came to deciding on investments in Route 1, municipalities were required to sign an agreement to work with each other and support land-use measures that would regulate development along the corridor. More than $2 million was invested into the effort, but the project was scrapped in March 2011 by Gov. Paul LePage and Transportation Commissioner David Bernhardt, who said the department’s economy-stressed budget would be better spent on maintenance as opposed to large capitol projects. Instead of major investments, the DOT’s focus is now on controlling development and traffic patterns along the corridor that could exacerbate congestion. Wiscasset and Edgecomb selectmen, for example, are in discussions with the DOT about measures including creating one-way streets to ease traffic entering Route 1 and stationing officers in Wiscasset’s downtown to usher pedestrians across the street in groups — a measure that already has been tried and had some success, according to Smith, and may return next summer. The towns are expecting recommendations from the DOT on that front in the next few weeks. Chris Dilts, executive director of the Wiscasset Area Chamber of Commerce who runs a bed and breakfast in Wiscasset, said any improvements are welcome with the exception of the now-defunct bypass idea. The congestion has a ripple effect far outside of Wiscasset. North of the town, in Newcastle, Town Administrator Ron Grenier said the summertime congestion is “a major hassle” for anyone traveling south. Grenier said Newcastle’s residents and selectmen were enthusiastic supporters of the Gateway 1 project — even though it could have ended up working against some of the town’s interests such as broadening the tax base with new businesses along Route 1. Grenier said the town is rewriting its land-use code, which will allow for more commercial development. However, according to Mooney at the DOT, too much development on Route 1 could lead to new gridlock in the future. That’s why the department requires any new business on Route 1 that could attract more than 100 vehicles during peak traffic hours to go through a permitting process that includes a traffic impact study and possible installation of mitigation projects such as turning lanes and traffic lights. Eric Gallant, executive director of the Mid-Coast Regional Planning Commission, which helps towns with transportation planning, among other things, said that while there may be widespread concern about the future, he doesn’t see Route 1’s problems as impediments to economic development. Audrey Lovering, development director for the City of Rockland, agreed. Lovering said Rockland is looking for local solutions to ease traffic on its Main Street, which is also Route 1. The city already has installed a speed table and is looking at other measures such as more public transportation options and making space for pedestrians and bicyclists. Mooney said the DOT also has its eye on the long-term health of Route 1. He said in the past 10 years, the department has invested tens of millions of dollars in Route 1, including repaving more than 50 miles of highway between Brunswick and Rockland, improving the corridor north of Camden Village and a major reconstruction and widening project in Thomaston and Warren. There are also bridge maintenance projects in the pipeline in Bath, Wiscasset, Woolwich and Newcastle. Those projects represent only a percentage of the overall need, but Mooney said it’s a matter of funding. “It’s inherent in everything we do to use public money as wisely as possible,” he said. Frank Rissell of Wiscasset is co-founder of a grassroots organization called ROAD, which stands for Route One Alternative Designs. Though he said the group formed originally in opposition to the bypass idea, it favors just about any other solution that will help ease the problem. “We really hope the powers that be will put some solutions together,” he said.